The crooning purr of the turtle dove in times past was the undisputed sound of summer, and yet, those born after the 1960’s are unlikely to have ever heard this quintessential summer song. In the last sixty years, the turtle dove has suffered dramatic declines in Britain, and there are believed to be only around 5000 left today. They are one of Britain’s fastest declining birds, and there is a very real chance that before long they will go the way of the dodo. Turtle doves are smaller than collared doves, and slightly bigger than a blackbird. Should you be lucky enough to see one, they are easily identifiable by their distinctive colouring, which is much more resplendent than that of collared doves and pigeons. Their lovely trilling is matched by the beauty of their feathers, and they brighten our summer landscapes with their elegantly tortoise-shelled shades of autumnal golds, soft blues and pastel hues. The rapid dropping of their numbers since the 1960’s can be attributed to various factors. In Britain, changing farming practices has resulted in reduced access to seed, as well as reduction in hedgerows, which are important habitats and breeding sites for the turtle dove. Further afield, turtle doves must run a feather-raising gauntlet during their migration from Africa, where they live during our winter-time. Their migration is a remarkable feat of endurance, and they can clock up 300-500 miles every night (they tend to travel in the dark). This epic journey sees them travelling through Morocco, Malta, Cyprus, Greece, France, Italy and Spain, where colossal numbers are shot by hunters as the birds pass through. Droughts, desertification and habitat loss in Africa further exacerbate their plight, as their winter habitats become more scarce. Those who make it back to Britain arrive in late April-May, and leave again between July and September. They breed during this time, and both males and females incubate the eggs for around two weeks before they hatch, after which the parents share the feeding duties. 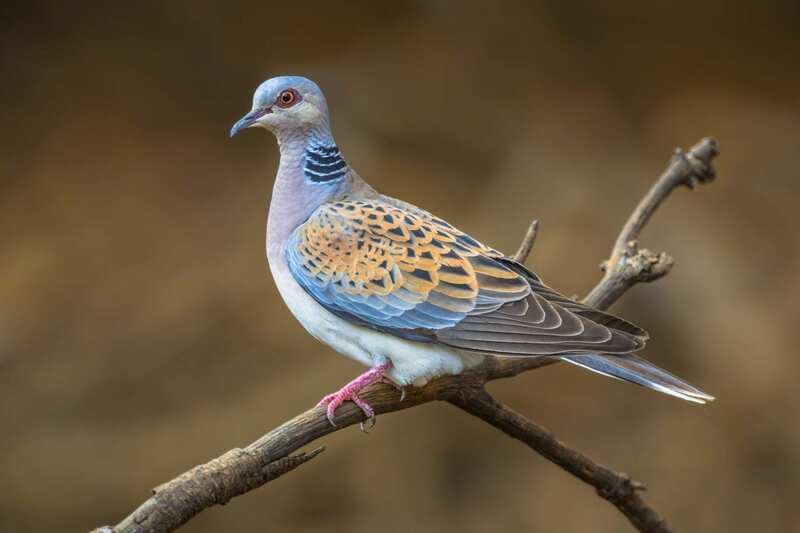 Their propensity for strong pair-bonding, and their Biblical and folkloric connections to love, means the turtle dove has become a symbol of romantic love and devotion. The majority of turtle doves are found in south-west England, although they are occasionally spotted in lowland Wales. They feed on small fruit and seeds from flowers, such as buttercups. They are notoriously shy and retiring creatures, and more often are heard rather than seen. If you suspect that turtle doves live near you, you can help them by distributing niger seed in your garden, especially in April when they return and need to regain strength after their gruelling migration route from Africa. Successful rewilding project Knepp Estate enjoys the transient company of turtle doves, who take their summer refuge in the sanctity of this wild and thriving swathe of land. Perhaps the peaceful glades of Cambrian Wildwood will too attract this stylish guest, and future visitors may be lucky enough to hear the dreamy tur-tur-ing (that earned them their Latin namesake, Streptopelia turtur) from the sprawling and secluded thickets.